It's already black superhero overload in Marvel's upcoming Black Panther movie, but they actually kicked around the idea of adding one more. And this isn't some loser hero either like Triathlon or something (no offense, Triathlon fans), Ryan Coogler revealed that at one point he considered including Elijah Bradley aka Patriot into the script. Why would that be a big deal? Well, Patriot is a member of the Young Avengers, but more importantly he's the grandson of Isaiah Bradley, the first black Captain America. Crazy enough, for comic book fans, we toyed with the character Patriot for a little bit. Early on we were interested to get our hands on him, Joe [Robert Cole] and I, but that ended up going away so we could focus on Wakanda a little more. The ones that you see were kind of always there. M'Baku, Killmonger, T'Challa, Nakia, Okoye, Shuri, Ramonda, Klaue, Everett Ross... they were always in every draft. So we had to make sure that they all had arcs, and it had something to do with that. Or at least I think he's referring to Elijah Bradley and not the brand new Patriot, Rayshaun Lucas, who recently took up the mantle and is now Falcon's apprentice. I would love to see Patriot get his shot in the MCU, but preferably in a Young Avengers movie or...waitaminute, isn't Chris Evans' contract up? 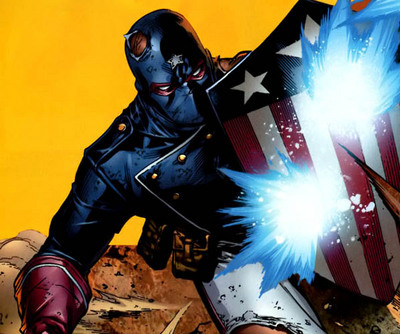 Rather than Falcon or *snooze* Bucky taking over as Cap, why not have Patriot step up to the plate? Either of them. Black Panther opens February 16th.